Back in May, I finally had the opportunity to visit the Perryville Battlefield State Historic Site, where on one afternoon in October 1862 the 79th Pennsylvania played a key role in saving the Union army from disaster. The battlefield seems like it's an hour from anything else, but it's certainly a compelling and well-interpreted site. While the armies engaged were relatively small, the casualty rates were extremely high. The ground is a series of undulating ridges, which helps to delineate the engagements and understand their sequence. I definitely recommend visiting the battlefield, preferably by foot or bike. I got the chance to walk the battlefield, focusing on the site where the Lancaster County Regiment, and met with park manager Kurt Holman. 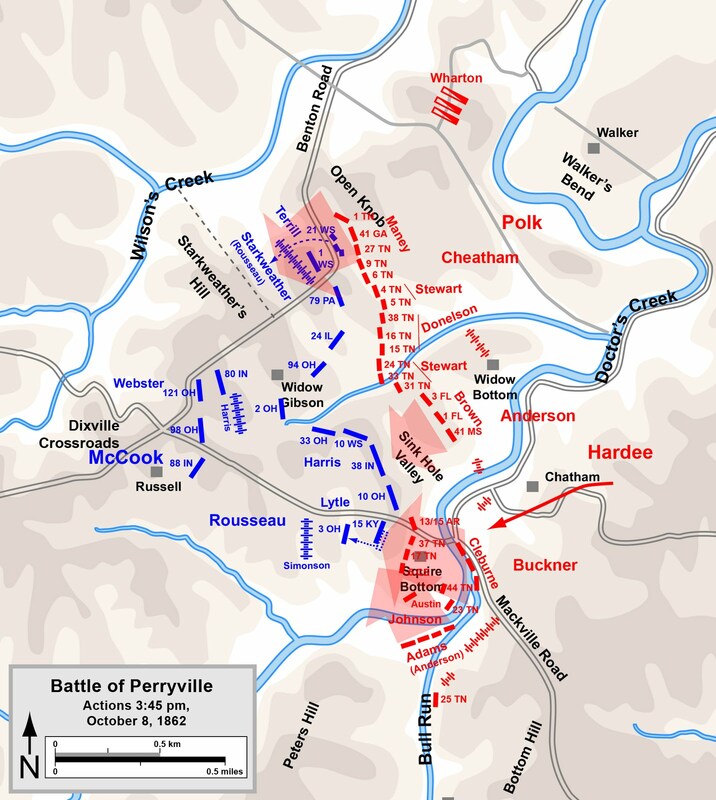 Besides dropping off some eagerly devoured primary sources (available here), we had a discussion to straighten out the 79th Pennsylvania's role in the battle. Kurt -- probably using Ken Noe's book -- had them moving a couple different places over the course of the afternoon, where primary sources make it fairly clear that the regiment stayed in one place for the duration of the fighting. We seemed to reach a pretty satisfying conclusion (matching what I wrote in a previous post), and Kurt updated park maps and files. The 79th PA fought on a shoulder ridge that stretched south beyond a bend on the Benton Road from a hill on which the 1st Wisconsin and Bush's and Stone's batteries fought. To their front was about a 100-yard down slope that ran into a wood lot on land not suitable for farming. The 24th Illinois would have been to their right, but the ground drops off and it does not appear as if that regiment coordinated with the 79th PA. So, it's not hard to imagine how the 79th Pennsylvania felt isolated in their position. Left flank of 79th PA battle line, looking north. Col. Hambright swung out his left two companies from this position to provide a flanking fire on Confederates to the regiment's front. The 1st Wisconsin fought beyond the 79th PA's left flank on the hill with the artillery piece. View of 79th PA position from front left (roughly from the direction of the 1st Wisconsin.